The Ultimate Veggie Sandwich and a Shun Knife and Boos Block Giveaway! 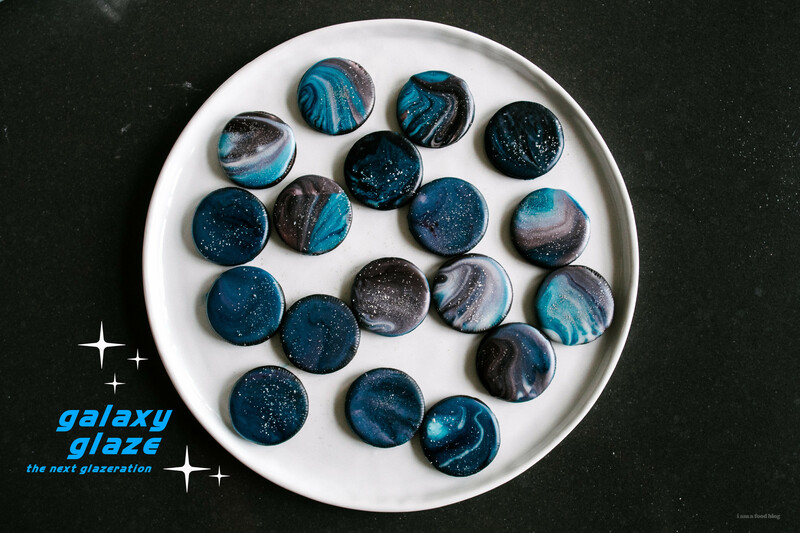 I'm obsessed with all things galaxy, hence these galaxy glazed oreos. You can use this technique on just about anything that needs a bit more intergalactic flair! I have a very obsessive personality. I can fixate on one thing for hours and hours, days, even weeks. Lately it’s been galaxy donuts. I could spend hours looking at their delicious, glossy glaze. That mix of blues and purples with sparkly silver…swoon. I’ve been going down an internet/instagram hole of galaxy things, so much so that every time Mike looks over at what I’m doing, it’s inevitably galaxy related. I wanted to give galaxy glaze a try but didn’t want to make donuts, so I came up with the brilliant idea of glazing some oreo thins. I thought it would be relatively simple, especially because I googled the heck out of it. But it turns out, even if a website boasts that they know the key to galaxy glaze, they most probably don’t. Most of the sites I ended up on had a picture of the donuts that I wanted to make, but then, at the end of the page, they’d show their pathetic, unattractive and very un-galaxy like donut glazing attempts. Lesson learned friends: don’t just drop food coloring into a bowl of icing thinking it’ll end up as a gorgeous galaxy. I had quite a few sad oreos before Mike took pity on me and told me he’d figure it out. 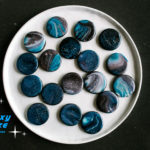 Mike’s exceptionally good at color theory (he is a designer, after all) and after a quick experiment, we were churning out galaxy oreos like there was no tomorrow. 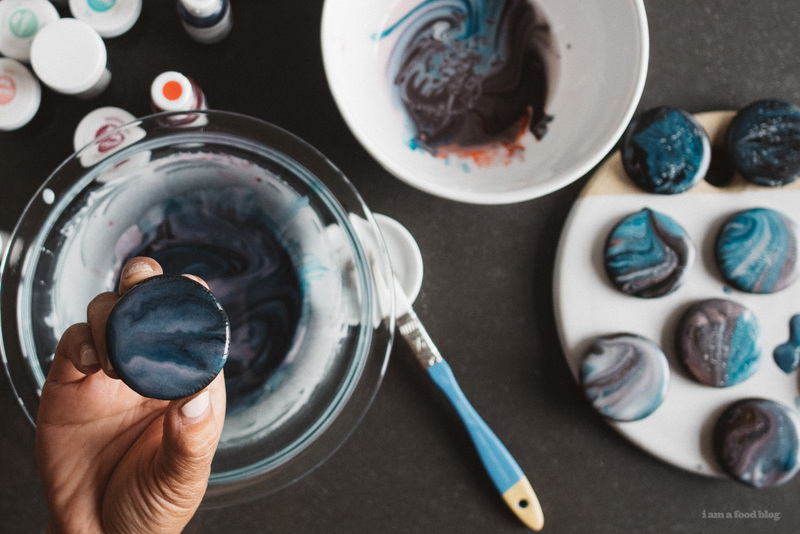 This galaxy glaze is seriously out of this world fun. Chat soon, I’m going out to buy a bunch of things I can randomly galaxy glaze! This is a standard donut glaze that will glaze just about anything: donuts, cookies, cakes. Like most icing sugar based glazes, it will harden over time. I used Americolor gel colors in navy blue, red red, and maroon. I also used a bit of silver pearl dust for that extra bit of shimmer. Mix the icing sugar and milk together until smooth. Spoon a bit of icing out into a separate bowl and keep it white. 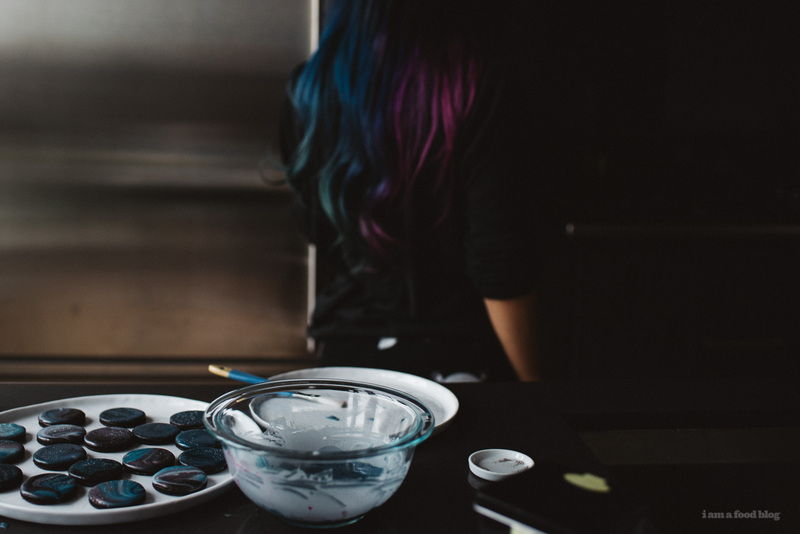 Tint your base with just a bit of food coloring – you want it to be very pale, with just a hint of hue. Mix well. Drop on 2 drops of blue and one drop of red and using a chopstick or skewer, drag the color back and forth in one direction, not quite mixing it together, but creating streaks of color. Dribble some of the white icing back on top. With a smooth swooshing motion, dip your cookie or donut into the surface of the glaze, pulling it along the surface to achieve streaks. Let the excess drip off and place on a plate to let dry. Dust with glitter, if desired. 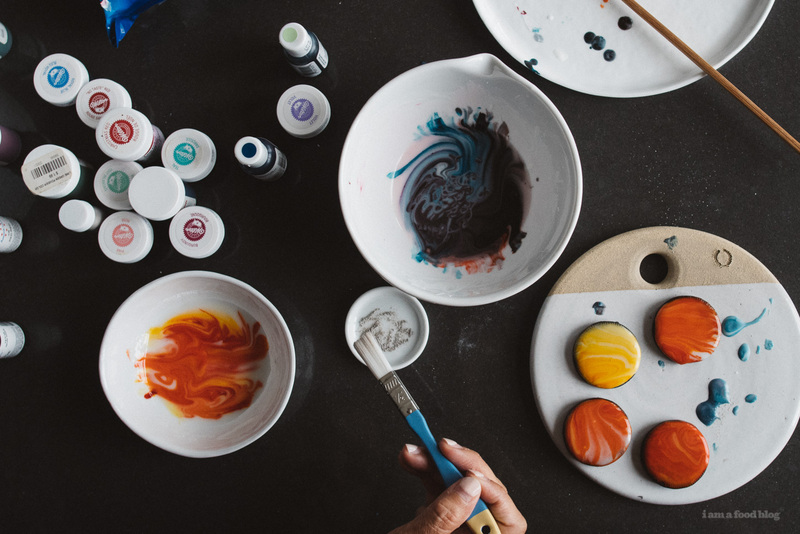 From time to time, add more white icing to the bowl to ensure the galaxy effect. THESE LOOK AMAZING!! 😍 definitely legit galaxy glazed deliciousness. also, can you convince disneyland to serve these at space (okay, technically hyperspace rn) mountain? thanks. I’ve been wanting to try out the galaxy glaze ever since seeing those donuts by h.rebel. It makes me so happy that you did this! I need to try ASAP! THESE TURNED OUT SO GOOD. These are stunning! Any chance you would consider making a video of this? My little boys love baking and space. I am definitely making these cookies. Thanks. They look beautiful. OKAY IM MAKING THESE ASAP. You just blew my mind. These are GORGEOUS! 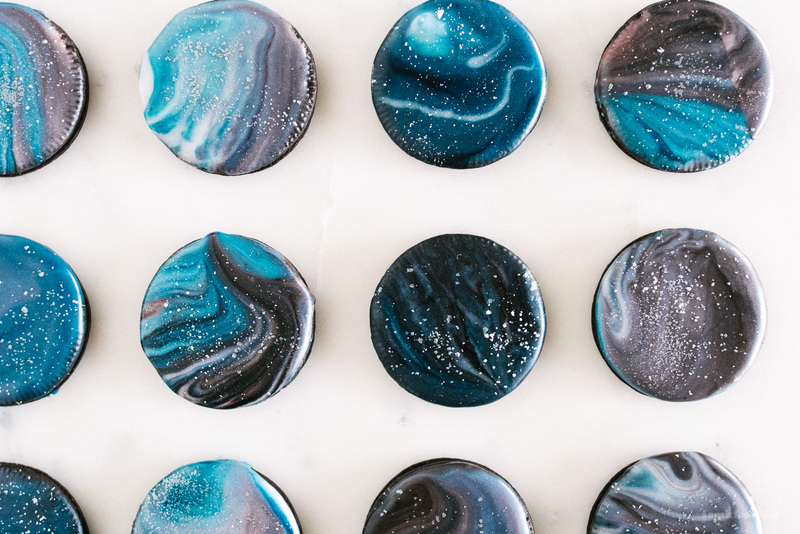 These look amazing, I definitely want to make a galaxy glaze! These look so cool!!!! Our family is into all things solar system, so this caught my eye in no time! Do you think this would work for icing a (chocolate) cake? Or would you recommend frosting the cake normally first then pouring this over it? 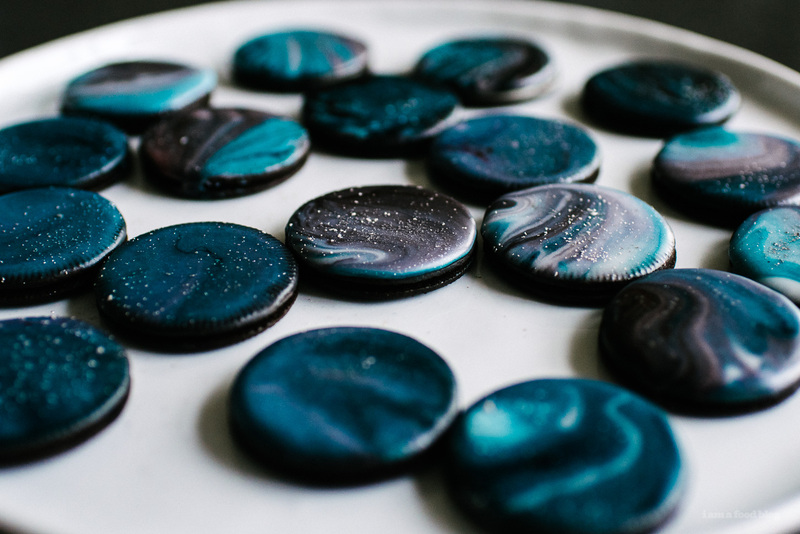 The only problem with this glaze is that you end up with cookies that are too pretty to eat! its absolutely gorgeous! how long did your icing take to dry? wanna try these out soon and am very curious about it! it took about an hour! a) do you think it would work with a non-dairy milk such as soy milk? b) how did you get that black space colour? is it just the oreos or does one of the gel colours look dark like that? THIS. IS. LIFE CHANGING. we are trying to make this at school hopefully it turns out at great as this 😍😍😍 WELL DONE!!! I’m going to try these for a solar eclipse party! Test glazing as soon as the gel colors arrive! They’ll be perfect for the party, thanks! Could you pour this over a cake? i haven’t tried so i’m not too sure how it would look, but i think it might work! These ROCK! 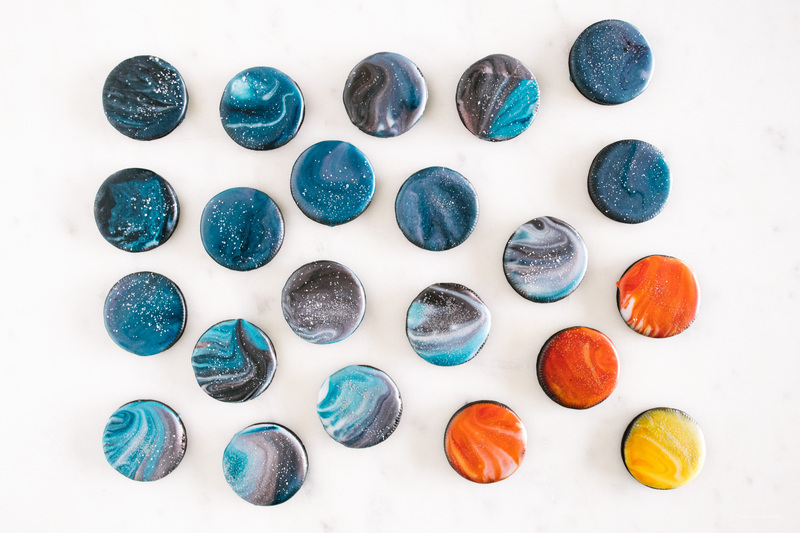 I want to make some for my son’s outer space party; the glaze should keep for a couple of days, right? I don’t see where you added the black in the post, though. Is it dropped in or is that a tinted glaze base? Thank you so much for sharing this! hi rox, the black was dropped in. 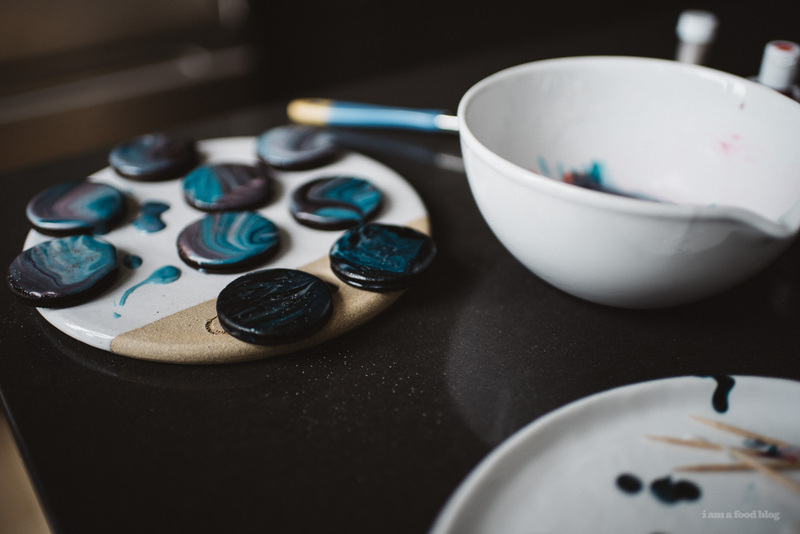 the base color is pretty light, but the drops of color get mixed in naturally when you are dragging the cookies along the surface of the glaze. hope that helps! also, the glaze should last for a couple of days (covered and wrapped), but don’t add the color in until you glaze the cookies, which you should do on the day of the party.